We'll try to help as time permits. There's considerably less time to chat some times than others. Many questions can be answered on our website; see the articles posted for your reference. 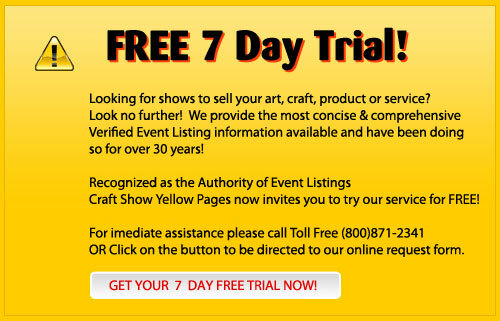 This is the home of SmartFrogs.com ™ For all your show listing, art and craft shows, street fairs and much more! Our belief is simply that the more details you have about an event, the better you'll understand a particular one will attract buyers who fit your customer profile. Your product is one of the keys : heavy stoneware will not sell where ferris wheels and other rides are available. (Who's going to tote that big, heavy thing around?) Low cost jewelry may sell well there, -if your customer is a teen or young twenty-something. More expensive jewelry belongs at a juried craft show. Juried craft shows often have a small admission fee at the door. (As qualifiers go, this is a good thing!) Once someone pays a few dollars to get in, you know he's more likely to buy something he really likes . So if you're a professional jewelry craftsman who sells jewelry in a range of prices through medium ($30-$50) and higher prices, these are the events to look for: Juried craft shows with an admission fee, - and don't forget to look for electrical hookup. Jewelry is so tiny, if it doesn't sparkle, they won't see it. Pay a few dollars extra for electricity at your exhibitor space. Where will you find detailed information like this? 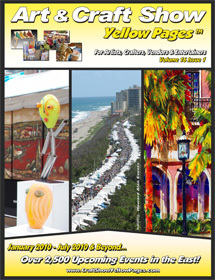 In Art & Craft Show Yellow Pages, - of course. That's what I've been telling you. You need this subscription: Knowledge is Power!